Eddie Castillo, general sales manager for the subprime division for Pine Belt Cadillac in Toms River, N.J., described how much a customer who has completed financing online prior to coming to the dealership improves the entire delivery experience — especially for consumers with soft credit histories. Castillo relayed his experience as SpringboardAuto released results of a new survey that determined consumers want to finance their vehicle online and doing so significantly improves their overall car buying experience and perception of the dealership where they take delivery. The survey, conducted among consumers who have recently financed a vehicle online with SpringboardAuto for the purchase of a vehicle from a dealership, provides a snapshot of how consumers’ impressions of dealerships improve when they can complete financing online before setting foot into the dealership and shows a significant positive impact on CSI and retention. The survey, conducted online in November and December, asked consumers to compare their perceptions of completing financing at the dealership versus completing it online prior to purchase. The result? The majority of those surveyed also reported that the finance experience online was easier and more pleasant and hassle-free than what they had experienced previously at a dealership. They stated that what they liked best is the ability to do it all online, followed by not being rushed and having more control over personalization. The survey also made clear that these consumers have been hampered by fear when heading to a dealership for financing, and that fear is fueled by lack of information and feeling disempowered. “It comes as no surprise that consumers want to feel more empowered and more informed during the auto financing process — and that they want to do it at their own pace. What is especially striking is that if they have that opportunity, their positive feelings about their dealership skyrockets,” said Jim Landy chief executive officer and founder of SpringboardAuto. 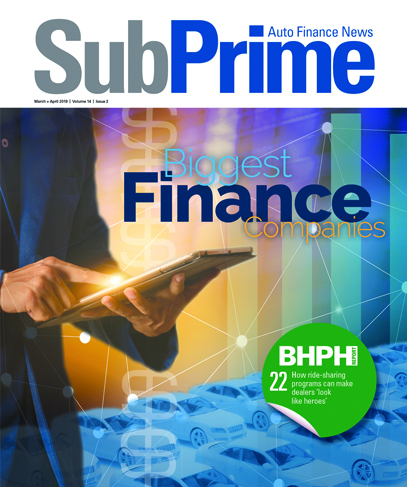 “With today’s technology providing multiple platforms that enable consumers to complete financing online and, in many cases, qualify for financing they may not otherwise be able to get through a dealership’s F&I process, the opportunity for dealerships is significant — especially if that platform is seamless, and easy-to-use,” Landy continued. “Dealerships gain where it counts most to their bottom line: in service visits, loyalty, positive word of mouth — and that critical CSI score, all while saving time spent on financing paperwork,” Landy went on to say. • Overall, customer perception of dealership increased in favorability by 115 percent as measured by likelihood to return to dealership, give a 5-star rating and recommend to friends. • The financing preference of the vast majority surveyed is to go online prior to visiting the dealership: 86 percent versus 5 percent who want to do it in the dealership. • These are not finance newbies: Eighty-one percent have financed via the dealership in the past. • Eighty-four percent found the dealership financing experience frustrating and time-consuming, while only 16 percent found the experience hassle-free and convenient. • Ninety-two percent said that working with an online financing platform was easier, more pleasant and hassle-free than their previous dealership finance experience. • Respondents cited being able to complete financing online (82 percent) as the thing they liked most about the process, closely followed by not feeling rushed and being able to proceed “at my own pace” (80 percent) and more control over personalizing the contract (72 percent). • Eighty-one percent said concerns about their credit score had held them back from financing via dealership in the past. • Getting the best interest rate and term trumps all else, including experience, for top priority in auto financing, with pleasant and hassle free coming in second. Landy added that, while there will always be consumers who want to finance in the dealership, today’s customer is increasingly looking for more control and personalization in the experience and to do it digitally — and that this is particularly true among millennials.